BOWMASTER, THE TRULY PORTABLE BOW PRESS! The #1 selling portable bow press! 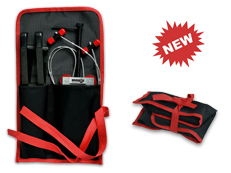 The Bowmaster® Portable Bow Press puts all the capabilities of a full size bow press in the palm of your hand. The Bowmaster is small enough to fit easily into your belt pack or even your pocket, making it "the truly portable bow press". The Bowmaster portable bow press allows the pro shop or archer to easily replace the string or cables, install peep sights, adjust draw length, replace wheels or cams, replace the limbs or even replace the handle. 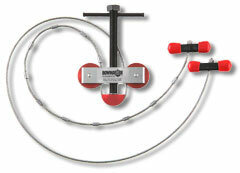 Try the Bowmaster today.......there is no other bow press like it! The Bowmaster G2 Bow Press adds to the capabilities and versatility of an already powerful press. The new 6" jackscrew allows for the complete teardown of bows with highly, preloaded limbs. The 6" jackscrew also allows the G2 to fit a wider range of bow lengths including bows with axle-to-axle lengths as short as 26.5". Without question, my Bowmaster press is one of the smartest and most useful additions to my hunting accessories I have made. "The Bowmaster does its job perfectly." The Bowmaster Portable Bow Press fits in the palm of your hand and weighs just 3/4 lb., yet has all the capabilities of a full size press. Fits most V split limb bows. Adapters required for full split limb bows. limbs up to 6º past parallel. Holds your Bowmaster G2 Bow Press and L brackets. This hand-crafted pouch is made of tough, poly/PVC laminate to help keep your Bowmaster press clean, dry, and ready to use. Thanks for a great product. For what it would have cost me to have a pro shop work on my bow I purchased your press and now I can do all my own bow work anytime any where. "The Bowmaster Bow Press is an excellent portable press I've taken afield for years." Every home bow mechanic needs a bow press and there is nothing more practical than the Bowmaster portable bow press. Small commercial explaining the Bowmaster bow press and showing its abilities. ASK FOR US AT YOUR LOCAL DEALER. and we will help you find one that does. Send mail to webmaster@PrototechInd.com with questions or comments about this web site.